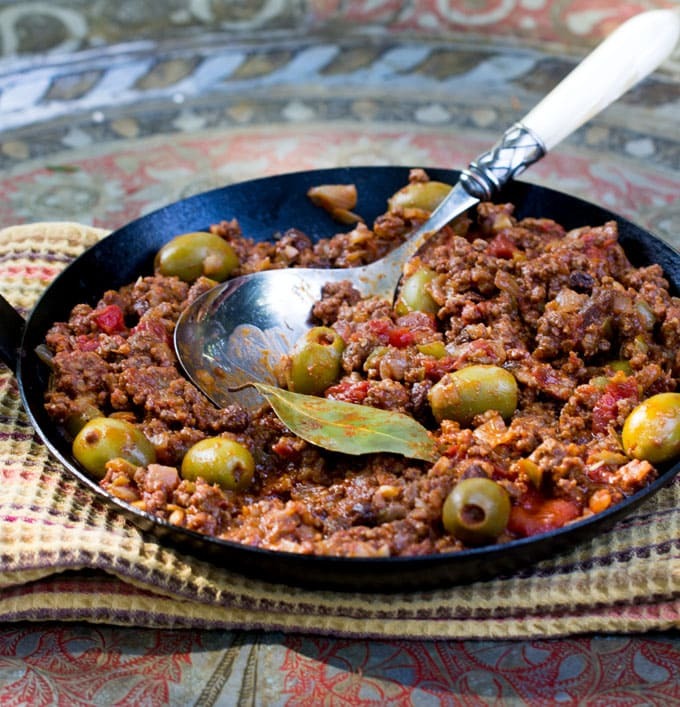 Cuban Picadillo is a sweet and sour ground beef stew in a flavorful tomato sauce with vinegar, onions, garlic, olives and smoked paprika – a quick easy The recipe is quick and easy, 35 minutes start to finish. 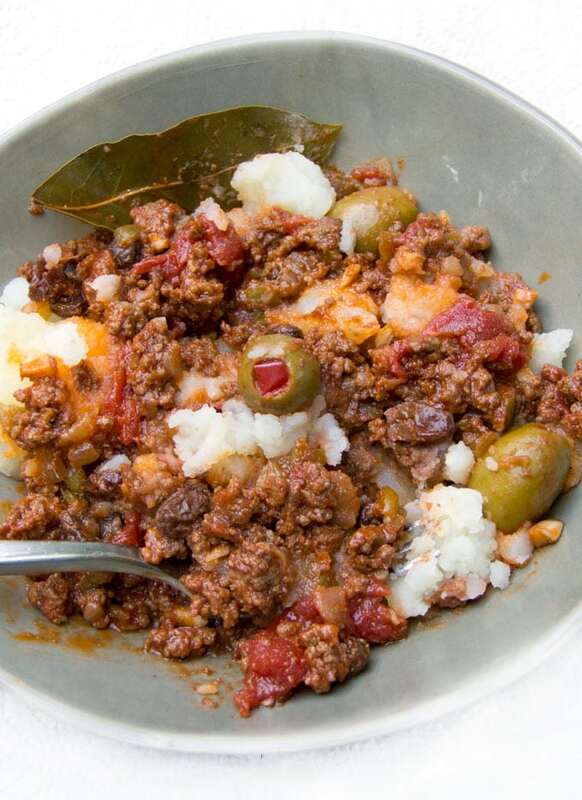 Serve Picadillo over mashed potatoes, rice or quinoa to soak up all the delicious sauce. Nothing is more tempting (unless you’re a vegetarian) than ground beef with tomato sauce, in whatever form it takes. There’s some sort of magical synergy between ground beef and tomatoes that results in some of the most irresistible dishes, whether it’s chili, meatloaf, sloppy joe or meaty pasta sauce. 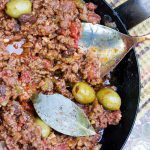 Cuban Picadillo, I recently and happily discovered, is one of those irresistible tomatoey ground beef dishes. The sweet and sour elements are what sets this one apart – sweet raisins, salty olives, tangy vinegar and smokey paprika. Picadillo has been called the ultimate Cuban comfort food, but I think “comfort” is too mild an adjective to describe a dish with so many layers of exciting flavor. I call it amazing. There’s nothing complicated about this dish. It all happens in one skillet, starting with a sauté of chopped onions, garlic and green pepper. After the vegetables soften a bit, the meat is added and browned. Then the tomatoes, vinegar, spices, olives and raisins are added. Everything simmers for 15 minutes until all of the flavors have melded. It’s traditional in Cuba to serve Picadillo with rice and black beans, a totally delicious combination. I also love this dish served over mashed potatoes. I make my mashed potatoes with no dairy, just boiled potatoes mashed with some olive oil, salt, pepper, and a little of the potato cooking-water. The light and fluffy bed of olive oil mashed potatoes is perfect for soaking up all the lovely, rich picadillo sauce. There are so many other delicious ways to enjoy Picadillo. It makes a great filling for tacos, empanadas, or burritos. Or how about stuffing poblano peppers with picadillo and making chiles rellenos picadillo, as they do in Mexico? Doesn’t that sound incredible?! I hope you enjoy this tasty Cuban stew. It’s one of those great recipes that’s delicious enough for company and easy enough for weeknight dinner. 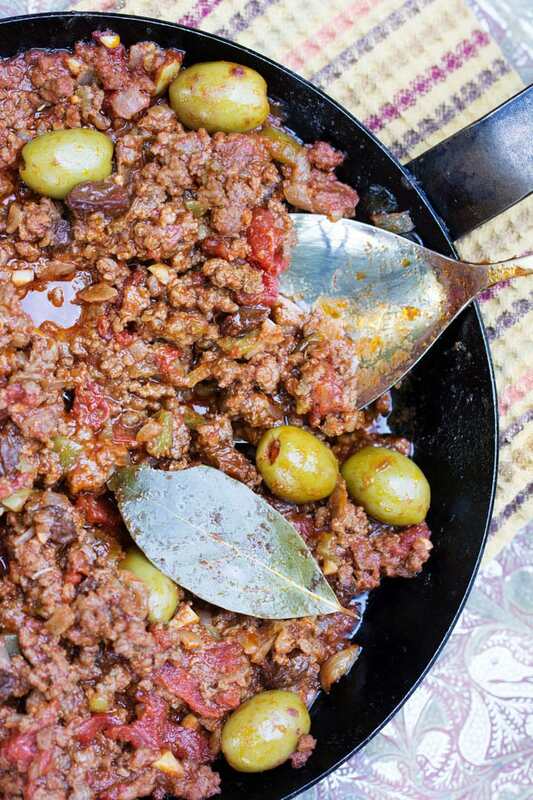 Here’s the recipe for Cuban Picadillo. As always, I’m hoping you will cook this and come back to leave a star rating and a comment. I’d love to know what you think. Picadillo is a simple stew made with ground beef, tomatoes and spices. It has exciting sweet, sour, salty layers of flavor, punctuated with salty olives and sweet raisins. Heat oil over medium-high heat in a large deep skillet or dutch oven. Add onion, garlic and green pepper. Cook for 5-6 minute, until vegetables start to soften. Add beef and salt. Allow meat to brown, breaking up clumps with the end of a spatula or wooden spoon, to achieve a crumbly texture. Add plum tomatoes, crushing them or tearing them into pieces with your hands as you drop them in. Pour in the plum tomato juice from the can too. Add tomato paste and stir through. Add vinegar, raisins, cumin, smoked paprika, bay leaves and olives. Bring to a simmer and cook for 15 minutes, stirring occasionally, until the stew is slightly thickened and the flavors are melded. Remove bay leaves. Serve with mashed potatoes or rice. Black beans are a great accompaniment too. Nutrition Information: The information shown is an estimate provided by an online nutrition calculator and is not a substitute for a the advice of a professional nutritionist. 30-minute meals are the best! Such a flavorful recipe! This looks like such a crazy cool combination! 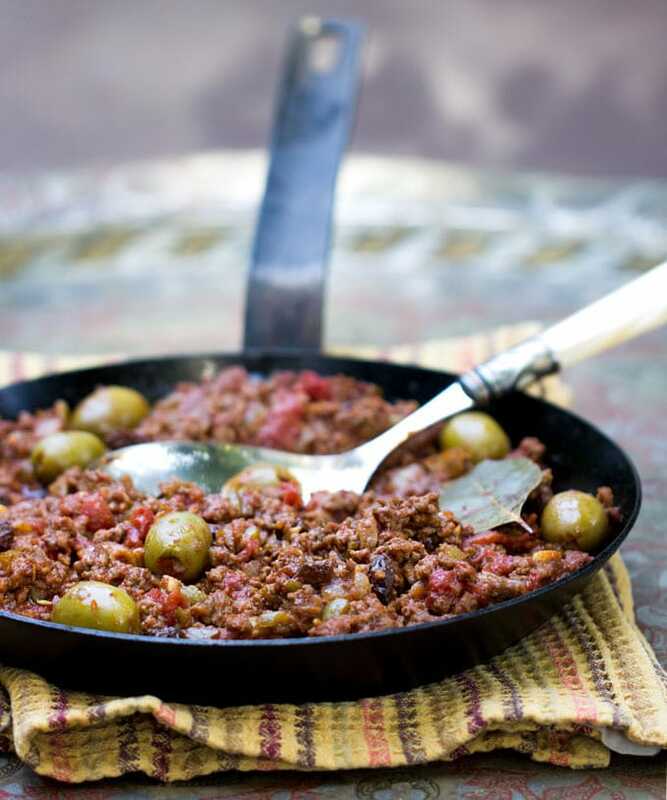 Picadillo is such a great base to so many dishes! Yum! I cooked this last night and it turned out great! I followed the recipe with the exception of a little more garlic and a couple pinches of Kosher salt at the end. The flavor is mild but perfectly melded. This is a keeper! I am giving this a try tonight, can’t wait! This looks so good! The flavor mix of the tomatoes, olives and raisins sound amazing! This is a FAV of my family although I don’t include the raisins (I have fussy kiddos). It’s quick, delish, and doesn’t cost an arm and a leg to make for a large group (think leftovers or large family gatherings) ! This definitely looks like something I would like…it’s going on my MUST TRY list! Thanks Michelle – I hope you enjoy! !